I have had some bad trades in my day. But lately, one call has been especially atrocious. For the past couple of years, I have taken stabs on the long side of the grain market. 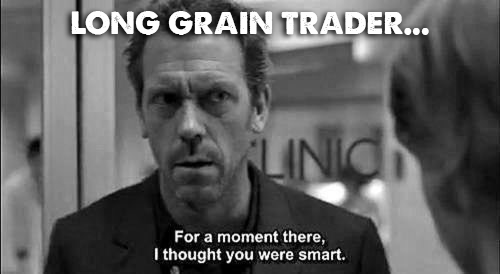 At different times, I have held various positions for different lengths of time, but make no mistake - grains have done nothing but cost me money. 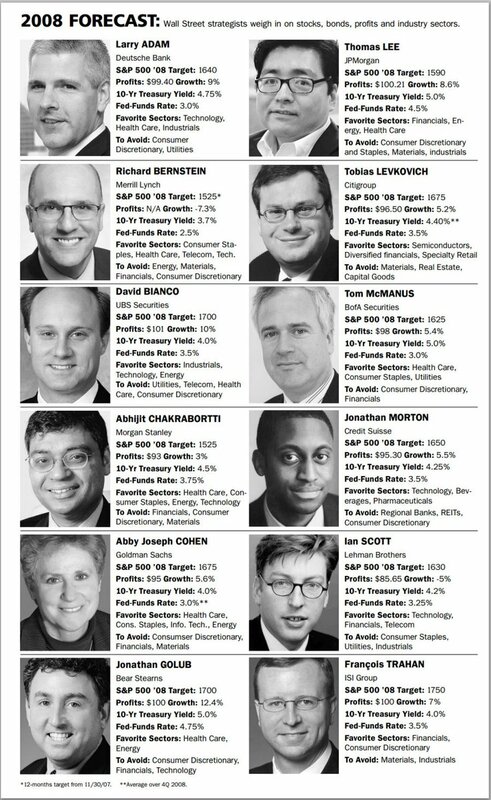 Sure, I might have a decent sounding argument, The Last Remaining Cheap Asset, but the market is indisputably telling me that I am dead wrong. And it’s hard to sit and watch the grains go down. Day after day. Week after week. Month after month. Like the slow drip of a leaky faucet that no one can fix, it can drive you insane. 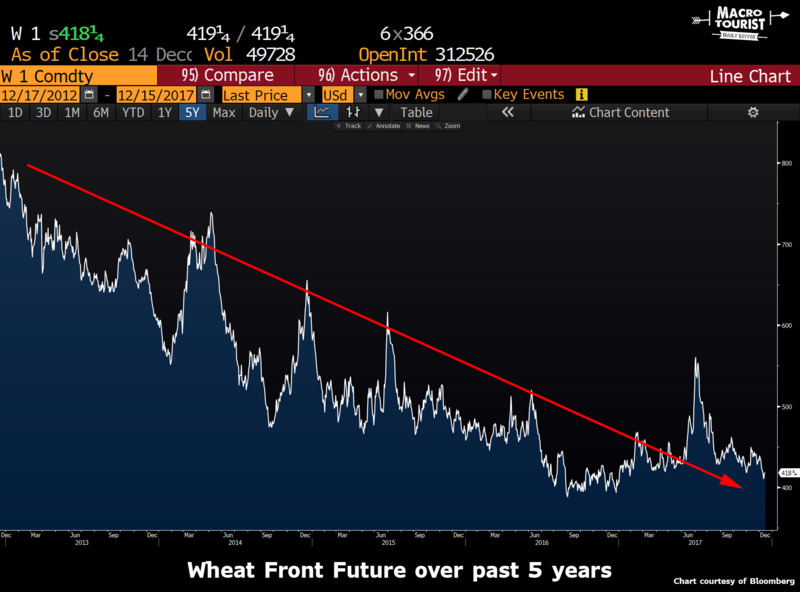 Have a look at the 5-year chart for front month Wheat. Tough to make money writing any blue tickets with that sort of action. All rallies have been opportunities to sell, not the start of any sustainable uptrend. This recent grain bear market has pushed the big three contracts (wheat, corn and soybeans) down to near all time lows when measured in real terms. I don’t want to bother with another forecast about why this time will be different, and how the low will be made in the coming weeks. 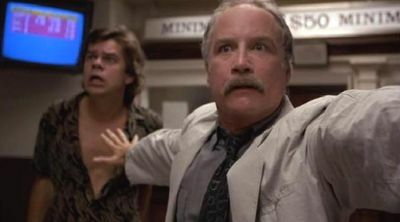 After a certain number posts, I begin to more closely resemble a degenerate gambler than a cool calculating macro trader (I think that number might be three, which means it’s too late for me, and I do in fact resemble Richard Dreyfuss a whole lot more than George Soros). And although I poke fun at myself, it’s no laughing matter. The amount of economic pain in farming is downright scary. According to an article in The Guardian, Why are America’s farmers killing themselves in record numbers?, the stress from low grain prices is causing an epidemic amongst the agricultural community. Last year, a study by the Centers for Disease Control and Prevention (CDC) found that people working in agriculture - including farmers, farm laborers, ranchers, fishers, and lumber harvesters - take their lives at a rate higher than any other occupation. The data suggested that the suicide rate for agricultural workers in 17 states was nearly five times higher compared with that in the general population. For the longest time, I had no idea why grain prices were so low. It perplexed me. Central Banks around the globe were printing money at an unprecedented pace. All else being equal, you would expect a real asset, like grains, to have rallied in these circumstances. Yeah sure the advances in farming technology might keep the price of grains pressured, but at the same time, demand has also never been higher, so you would expect the debasement of money to eventually win out and send grains prices skyward. But more importantly, these situations are usually self correcting. Nothing solves the problem of oversupply like low prices. Except this time. Even with the state of farming littered with heartbreaking stories of ruined families, not enough farmers are giving up planting crops to allow the price to rise. This conundrum would still be a mystery to me, if it wasn’t for one of my sharp readers, who sent me a note last week. It was actually a response to a post I made about Grandma’s Bond Portfolio is in Trouble, but Shaeffer Steward from Nesvick Trading Group, related it back to the grain market in such a unique original way, I felt it was too important not to share. I suggest that while Kevin’s assessment for the economy in general might be eerily accurate, it is ENTIRELY BACKWARDS for agriculture. Before you dismiss my hypothesis, hear me out. Primarily because commodity prices skyrocketed during the 2004-2008 super-cycle triggered by the ethanol buildout combined with huge demand growth out of China and when the GFC occurred in 2007-2008, many sectors of the economy literally collapsed under their own weight but agriculture actually thrived because the QE provided the accelerant to keep things going. You see, agriculture did exactly what you would’ve expected - lower cost of money & greater availability of credit (greater supply) - commodity prices remained rather high so farmers levered up, borrowed money and banks were glad to loan it to them as many were using land as collateralization on loans and after all, the land values were based off of what people were willing to pay (rent) to farm it or what sort of return they needed to make it a worthwhile investment. 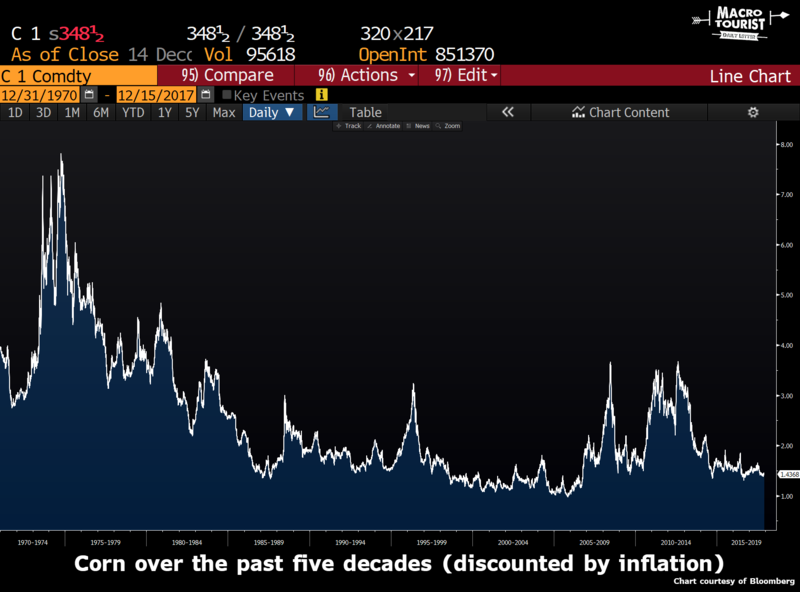 What we’ve seen happen is massive leveraging, steadily increasing cost of production (seed, chemical, fertilizer, equipment, insurance, land rents, etc) and now as prices come under pressure due to massive global oversupplies, margins have quickly collapsed and the cost structure hasn’t responded. Instead, farmers have levered up further by refinancing land and/or selling off some land to keep their bankers going along with them and the cycle has continued. Why would the banks lend to farmers when they didn’t lend to normal citizens? Why would farmers be willing to borrow money when normal citizens weren’t willing to borrow money? Glad you asked. Specifically, federally subsidized crop insurance. Farmers take extraordinary risks doing what they do BUT they now have access (and have had access) to crop insurance that protects a portion of their historical production and/or projected revenue. When I say “a portion” I mean upwards of 75-85%. When I say “federally subsidized crop insurance” I mean that the federal govt pays upwards of 65% of the premium on behalf of the farmer on some crop insurance policies. WHOA. Let me put figures to it for you. Imagine that you were a farmer and your history showed that your 5 year avg yield (actual production history) on your farm was 55 bu/ac and at planting time the insurance price for soybeans was $10.19/bu. Let’s say that it was going to cost you $550/ac to grow soybeans, so a breakeven type situation if you make ordinary yields at ordinary prices. Imagine that you could guarantee yourself $420.00/ac in revenue ($10.19/bu x 55 bu/ac = $560 bu/ac revenue x 75% coverage = $420 /ac) and it only cost you $3.70/ac. You’re paying $3.70/ac to guarantee yourself $420.00/ac in revenue. Pretty cheap, right? Yes, but the REAL cost of that insurance is more like $8.23/ac with the govt paying $4.53/ac and the farmer paying $3.70. Granted, there are some situations in which you can lose more and some causes of loss, such as hail are not covered by basic crop insurance and require a separate policy but in the grand scheme of things, the cost of protecting 75% of revenue is reasonable enough that farmers buy it and banks make loans that they might not otherwise make sans crop insurance policies. There is also increased risks because the loss calculations are based on futures prices at planting and harvest time and do not address the cash markets which might have wide, unfavorable basis so it isn’t anywhere near a complete failsafe but enough to keep the borrowed money flowing. Now we need to put it all together. The relatively “cheap” cost of subsidized crop insurance encourages the farmer to take risks he wouldn’t take otherwise. The balance sheet equity he has goes a lot further if you consider that he “really” only has $130/ac at risk instead of the full $550/ac so he’s willing to a) stay in the game and b) expand his acreage because if he hits a homerun on larger yields and/or higher prices, then JACKPOT!!. If it goes bad, he’s out $130/ac and it doesn’t completely wipe him out - plus he’s using the bank’s money at very low interest rates. The farmer not only wants to stay in the game but he wants to grow so he’s bidding up inputs and more importantly land rents because if you don’t have the land, then you’re out of the game. Revenues continue to be good, in general so the farm cash flow has meat on the bone and where there is meat on the bone, the dogs come chewing. Seed costs are higher every year and sometimes much higher. Equipment costs have gone FREAKIN’ PARABOLIC. Land rents have skyrocketed. Since many farmers are self-insured, health insurance prices have… well you know what they’ve done. Much of this expansion has been done with debt financing on equipment meaning that while the interest rates are low, interest costs are accumulating. You see, there HAS been demand for debt from agriculture and the lenders have seen positive cash flows and the revenue safety net of crop insurance as courage to continue to lend to farmers. Let’s take a detour for a moment here - banks have wanted to lend money but “conservatively” and if the average consumer really hasn’t had the appetite for borrowing money, that makes it a difficult task. If you’re a regional bank or small town bank and you can lend out money on 10-12 month agricultural operating notes to the tune of $500k-2.5 mil each isn’t it much easier to put $10-20 mil to work than if you were dealing with making retail loans for cars, houses, etc particularly since those loans are longer maturity loans? What if you could effectively put $20 mil out in annual operating loans with 12 month or less maturities at 4.5-5.5% via 25-30 loans PLUS the person borrowing it has 75% revenue protection bought via crop insurance as well as land & equipment collateralizing the notes at a time that equipment and land prices are zooming into the stratosphere?!?!?!?!?! Until commodity prices come under pressure because the supply side gets overstimulated, revenue side drops dramatically while the cost side remains sticky and then we get the massive transfer of equity from the farmer to a variety of beneficiaries including a) banks in the form of interest, b) landlords in the form of higher rent and higher asset(land) values, c) equipment companies in the form of inflated revenues due to inflated equipment prices, d) input providers in the form of higher prices for seed, chemical and fertilizer… all being transferred from the farmer’s balance sheet. Then you add in the intangible side to the equation: what is the farmer going to do if he decides to quit because he doesn’t want to take all of these risks? If he decides NOT to farm because he sees what is happening in terms of greater and greater risks to his equity what is he going to do to put food on his table? If he doesn’t pay the extra $25/ac land rent to keep a neighbor from renting it out from under him he’ll lose the land and then what will he do? There are only so many jobs “in town” to get and rural America is drying up so what will he do? You see, here is the hard part. He made the decision to get in or stay in the rat race even when he knew that the numbers didn’t make sense because he didn’t see a viable “plan B” and there was a banker standing there able and willing to continue to give him more and more rope until he finally hanged himself when the mouse trap flipped on him. THAT, fine sir, is where we are today in US agriculture. I apologize that this turned out as lengthy as it did BUT I felt that it was a worthwhile exercise to put these thoughts into email and share them with you because you are a student of the markets and also because you will hopefully be joining us for our Commodity Roundtable in January so a better framing of the situation might help you understand the circumstances they are facing. As a macroeconomist, how do we work out from under this situation? What is the roadmap for the US farmer? 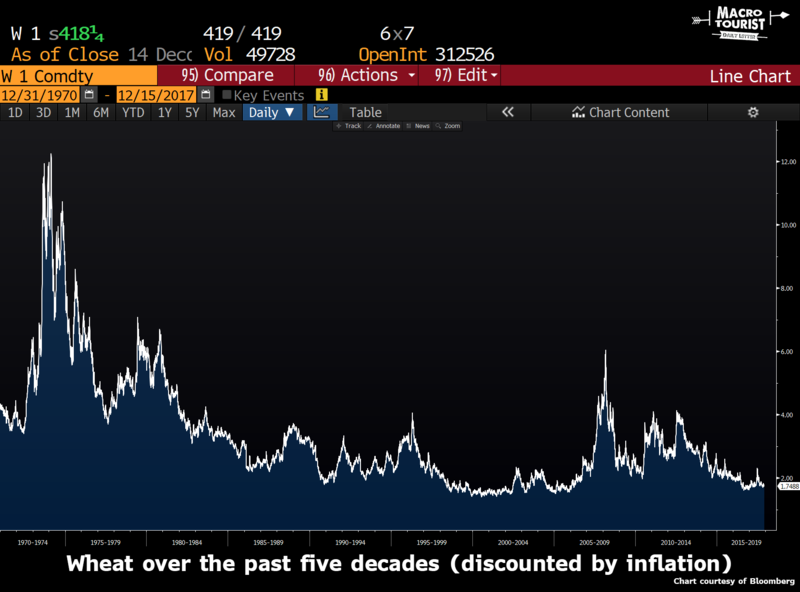 Higher commodity prices are a temporary fix as we’ve seen because as long as the money is available (available credit) and affordable (low interest rates) the inflationary explosion continues on the cost/input side of the equation. Currently we’re shrinking farmer balance sheets until banks won’t be able to lend to them any longer at which time the decisions will be made FOR the farmer not BY the farmer. Brilliant! I mean, f’ng brilliant. Shaeffer completely nailed it. The government’s subsidies have created a situation where far too much credit has been extended to an industry. This has caused inflation in prices of the inputs that go into farming, but not the output. Want another example? Have a look at Student Loans versus tuition inflation. 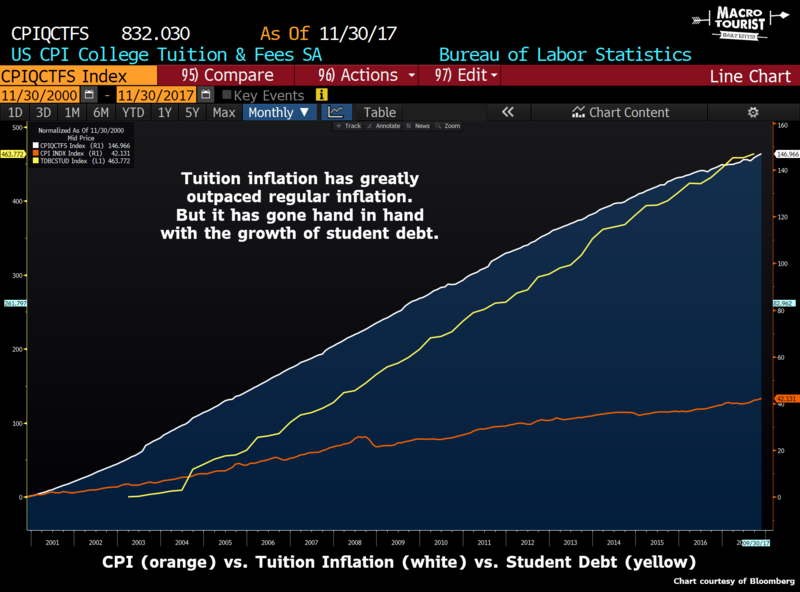 Tuition inflation has greatly outpaced regular CPI, but it has gone hand in hand with the growth of student debt. Over allocations of credit have peculiar effects on the pricing of both the inputs and the outputs of the affected area. Now I am not sure what to do about Shaeffer’s deduction. As long as subsidies exist, it seems that too much money will be allocated to agriculture loans, and will therefore, keep grain prices lower. But here’s a thought. Over the past half dozen years, there has been little demand for loans in the regular economy. This has encouraged bankers to lend to farmers with their government backstop. Yet what will happen if economic activity picks up? Loan demand across all sectors will increase, decreasing the amount of credit that will be extended to farmers. This will occur at a terrible time as grain prices are near rock bottom levels. Unfortunately, without as much credit, many of these farmers might be forced to quit. However, that will cause the price of the grains to rally. Maybe to a more sustainable level where farmers can once again make a living. Ironically, rising interest rates, might be the best thing for both farmers, and grain prices. Wait! Did I just make another bullish argument for buying grains? 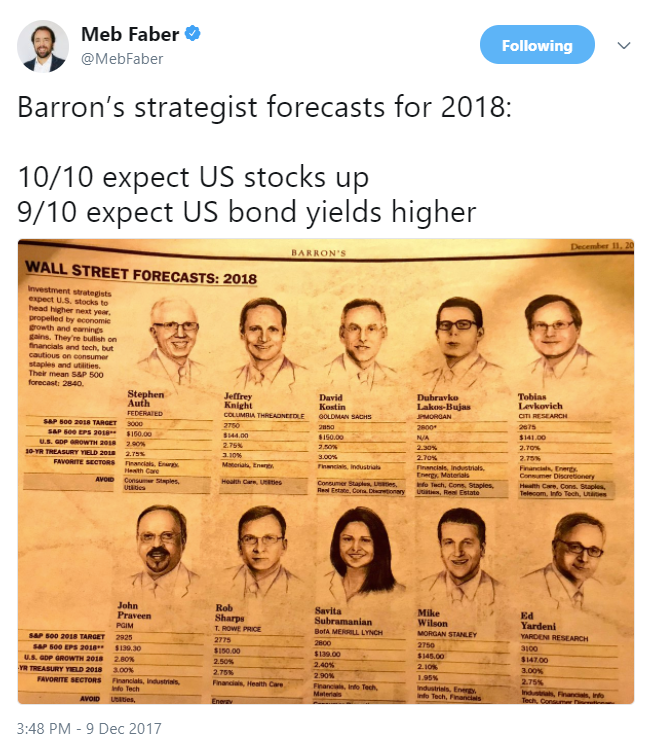 What’s that famous Wall Street saying? 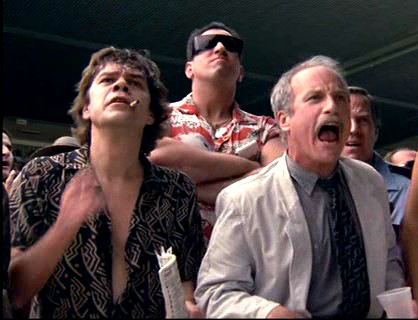 The dumb money trades in the morning, the smart money trades at the close. 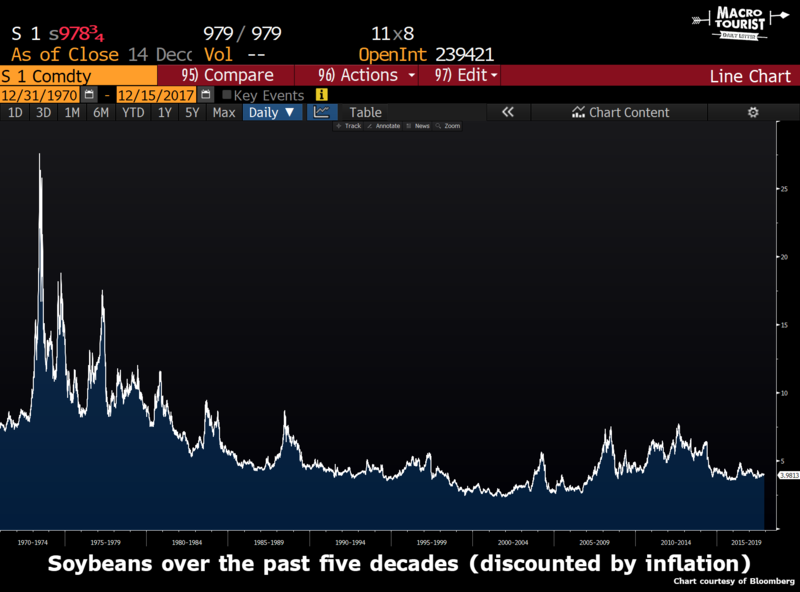 Well, astute market watcher Helene Meisler recently highlighted that the Market on Close (MOC) imbalances have consistently been to the sell side lately. In fact, every single day in December has seen MOC sell imbalances. Institutions often trade at the close, while the public is more prone to trading closer to the open. There has even been an indicator created to measure this phenomenon. If we look at the SMART Index, the late day selling shows up clearly with a big retreat from the highs. 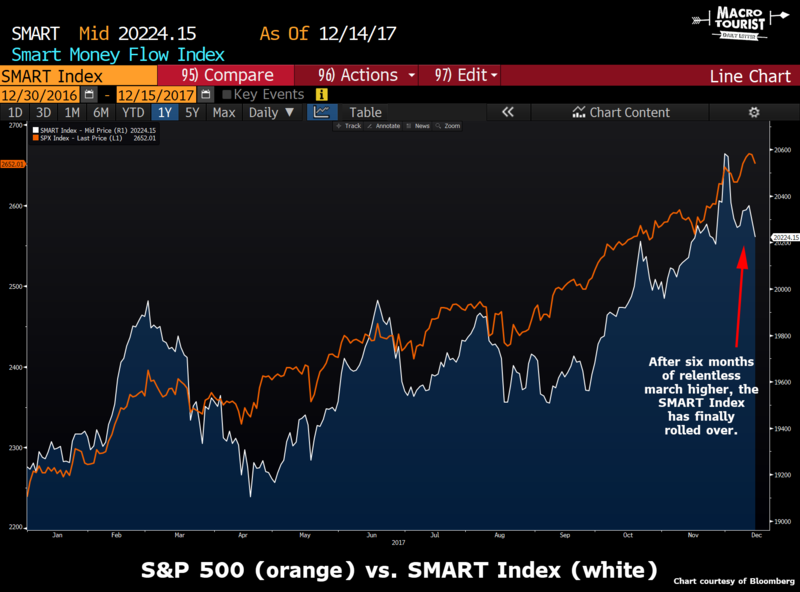 So far, the stock market has not followed the SMART Index lower in any meaningful way. But don’t worry, I am sure this distribution by institutions is somehow bullish. After all, don’t you know? Stocks only go higher. And where did it close? Down 38.5% to 903. Ooops. Just a little off.